Lagonda Rapide LG45R car at Silverstone in the 1950s. Homepage. 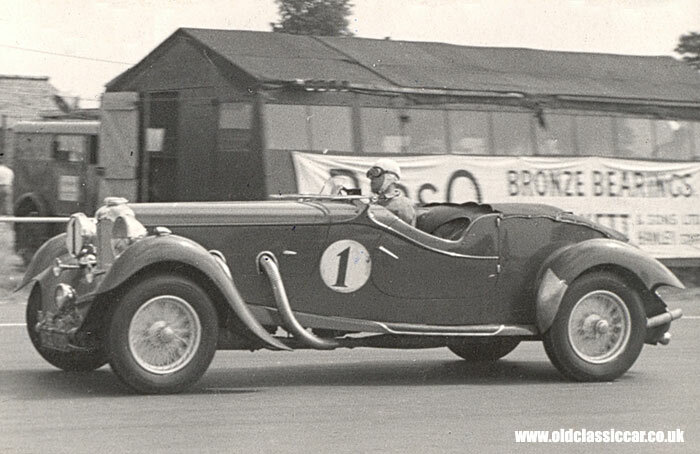 This page: Car no.1, a Lagonda Rapide, seen at the Silverstone racing circuit in the early 1950s. Michael emailed this picture over, along with some others, and hoped that someone would be able to identify the car. Some digging has resulted in this car, seen at Silverstone in 1953 I'm told, being identified as a Lagonda LG45R Rapide. The coachwork of the Rapide, a car that made it's public debut at the Motor Show of 1934, can be attributed to Frank Feeley. If anyone can confirm the driver behind the wheel of this Lagonda, please get in touch. A member of the VSCC has suggested the following: "I have a feeling that the Lagonda is one of the pair which ran in the production sports car race at the 1949 Daily Express Silverstone, driven by R.F.Wright and Hugh Howarth. This was the race where the XK120 made its debut. This could be Hugh Howarth. The Lagondas had race nos 1 & 2 that day, but I don't have a programme to do a check on which driver drove which. It can't be later than 1951 as crash hats became compulsory at the end of that season." Return to vintage car photos - Page 10. A photo of a road-going Lagonda M45 can be found here.